This ID Digital Drawing project involved choosing two types of products to generate a digitally enhanced concept page for each with Photoshop. The objective was to develop composition skills. I chose two products that were on my mind at the time - dongles because I was learning to adapt to the new MacBook's lack of ports, and lunchboxes because I had one that kept hanging on to the unpleasant taste of dish soap. 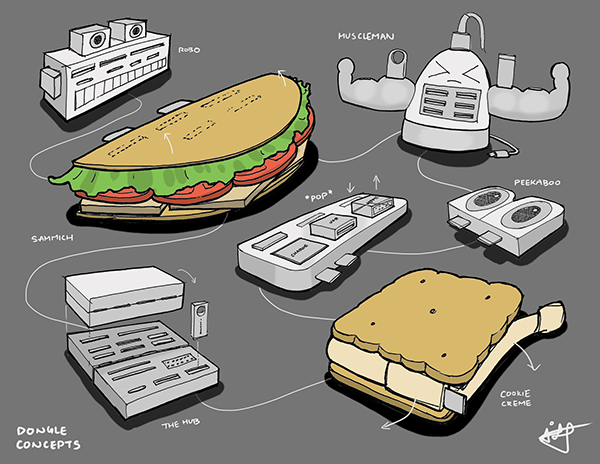 For the lunchboxes, I focused on exploring function, whereas since dongles have a fixed function, I found myself playing with quirkier, more superficial features. The exploration of these specific products were good exercises in ideating for both form and function. This ID Digital Drawing project involved sketching a speaker and adding texture and finishes in Photoshop. My concept is a wireless-charging, multi-speaker system that can operate from either the main hub, or be rearranged for a surround-sound effect. From the hub, sound can be directed by rotating each speaker to positions predetermined by magnetic strips. 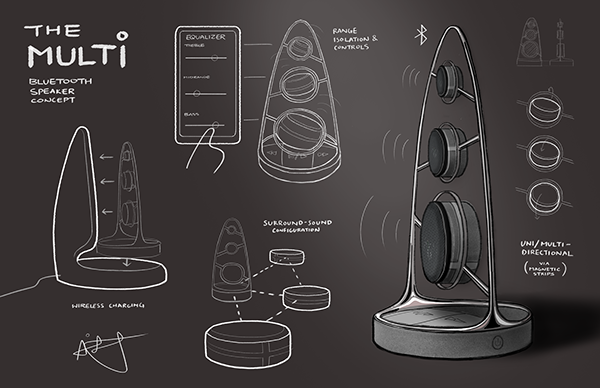 Each speaker outputs a different frequency range that can be fine-tuned via an app. Finishing is chrome and sand-blasted aluminium. 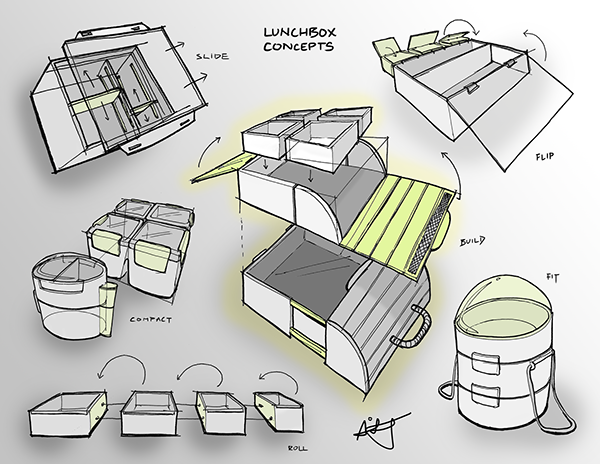 A collection of product concept drawings edited and enhanced with various sketching/design software.